Have you been scarred by meatloaf? I'm talking that circa 1980s dried out mess crusted with baked-on ketchup we have all experienced at one time or another in our lives. 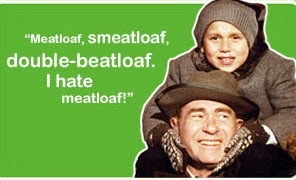 No wonder not many people think of meatloaf as something they're excited to put on the table for dinner! I've tried a few meatloaves over the years, Bobby Flay's veggie-packed one is one of my favorites, but I always get annoyed cleaning the loaf pan. It just gets so crusted and its impossible to serve slices well when you're digging it out of a grease-laden pan. So I've gotten rid of the pan. That's right, free-form meatloaf is where its at! This recipe is fantastic, not just because all you need is a rimmed baking sheet (you can even line it with foil to avoid cleanup completely), but because the flavor on this meatlof is delicious. It has zucchini in it, which makes it impossible to dry out and the topping isn't overly sweet, which my husband was a fan of. Give it a try and serve it up with a side of roasted broccoli and potatoes, its the perfect meal for when the weather is turning chilly. Preheat the oven to 350. Mix together the turkey, eggs, zucchini, panko, onion, a big pinch of salt & pepper, oregano, basil and garlic powder. Make sure it is well combined. Line a rimmed cookie sheet with parchment paper or aluminum foil and shape the meatloaf into a "loaf" shape. Bake for 1 hour. In a small bowl, mix together the brown sugar, ketchup and mustard. Remove the meatloaf from the oven and spread the mixture over the loaf. Return it to the oven and cook for 15 minutes longer (make sure it is completely cooked in the center with a meat thermometer, as no one wants to eat rare poultry!). Let it stand for at least 5 minutes before slicing and serving.